Yep, that's the defense hizzoner da former hip hop mayor has left as to why he can't pay more than $6 in restitution on a $120,000 base salary + commissions. Kwame Kilpatrick is living large because, his lawyer says, he has to. Kilpatrick's attorney, Daniel Hajji, made the claim in an impassioned 14-page motion filed with the state Court of Appeals late Tuesday in an effort to postpone the ex-Detroit mayor's Friday probation-violation hearing in circuit court -- one that could eventually land him behind bars. Wayne County Circuit Judge David Groner will arraign Kilpatrick for failing to pay $79,011 toward the $1 million he owes in restitution by last Friday's deadline. Kilpatrick and his lawyers say he doesn't have the money, despite his plush lifestyle in a tony Dallas suburb and $120,000-a-year sales job for Covisint, a Compuware subsidiary. "The clientele he must establish a rapport with are likely to be the privileged and the affluent," Hajji said in the motion. "Burgers and beer at the local bar is not going to be sufficient." I'm amazed his lawyer didn't just get up in court and say "Your Hona, The Kwamester has gots to represent, dig? Look, when you owe 1 million dollars to the city you ripped off and helped push over the edge into the abyss, burgers and beer are too high a lifestyle. I say Ramen noodles ought to be the high point of your daily gastronomic feast in such a situation. Kwame if he wasn't living so large and rubbing it in the prosecutor's and judges face could have gotten away with it. But spending hundreds of thousands of dollars and then claiming you can only afford $6 a month in restitution toward paying down a 1 Million dollar fine is not going to cut you any slack, and is instead an attempt to make the prosecutor and judge look like fools. Understandably, prosecutors and judges do not like to be made to look like fools, especially, as in this case, when they're holding all the cards. On the upside, Federal detention centers are far more stylish and lavish than the Wayne County Jail, probably a more privileged and affluent class of criminals to mix with there as well. Then Lawyers Make the Worst Clients. They do, they really, really do. Having one such situation now and it sucketh for a variety of reasons. Also, Doctors tend to be difficult clients as they tend to be so busy, they never get back to you with vital information and leave you wondering if they really want to have a chance at winning their case or not. Give me the tools and I'll do the job. Give me no support or facts to assist your case and it gets a lot harder to win for you. The Riddle of Race: Sam Riddle Trial Ends In A Mistrial After Black juror refuses to deliberate. Jurors in the corruption trial of political consultant Sam Riddle unleashed a torrent of emotions today, saying racial issues overtook deliberations, bringing a federal judge to declare a mistrial on the sixth day of deliberations. Jurors said all but one of the 12 was ready to convict Riddle on some or all counts. They said the lone African-American juror had her mind made up on acquitting him. Some said she refused to deliberate, though others said that at one point she was ready to convict Riddle on one of seven counts. . . .Riddle, 63, has pleaded not guilty to a seven-count indictment accusing him of conspiracy, extortion and lying to the FBI. Prosecutors allege Riddle teamed up with his one-time boss, former Detroit City Councilwoman Monica Conyers, to shake down businesses with matters before the Detroit City Council or the General Retirement System. On the courthouse steps today, one juror wept openly as she described her frustrations with the deliberations. "It was a long case, and we worked really hard, and because of one person ... we couldn't come to a unanimous decision," juror Sue Persichini said. "The person had pretty much made up her mind from the start." The only other non-white juror, Jay Gandhi, said she feared at one point the holdout juror was going to strike her with a binder. I wonder if Eric Holder, of nation of cowards about race fame, will candidly discuss the impact of a black juror not voting to convict a black man acting as a conduit to corruption that among many other corrupt city leaders has reduced a majority black city to shambles. I guarantee that had the racial composition been reversed we would have heard something from him by now. On to the next round, and for Detroit's sake a better jury next time. Not to mention DNA testing reveals his family tree was a straight line - Philadelphia isn't just a city in Pennsylvania. Egypt's famed King Tutankhamun suffered from a cleft palate and club foot, likely forcing him to walk with a cane, and died from complications from a broken leg exacerbated by malaria, according to the most extensive study ever of his more than 3,300-year-old mummy. It also established the clearest yet family tree for Tut, indicating for the first time that he was the child of a brother-sister union. The study said his father was most likely Akhenaten, the pharaoh who tried to revolutionize ancient Egyptian religion and force his people to worship one god. The mummy shown by DNA to be that of Tut's mother also turned out to be a sister of Akhenaten, though she has not yet been identified. Brother-Sister marriage was very common in Egypt under the Pharaohs, and the tradition continued on occasion with the Ptolemaic Kings of Egypt (The Macedonian Greek dynasty that ruled Egypt after the death of Alexander the Great and ended with the death of Cleopatra and Mark Anthony). Such marriages fit the Isis/Osiris concept of God-Kings and God-Queens ruling Egypt and also kept the royal real estate in the family. As with King Tut, it also at times passed down some genetic deformities. 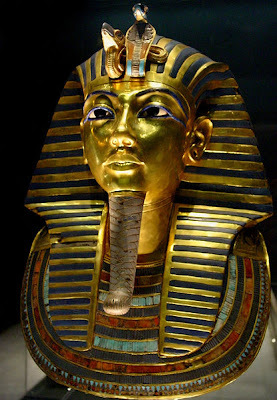 The treasures of King Tut's tomb are truly fantastic. I recall as a child seeing them on display at the Royal Ontario Museum, which was what kicked off my interest in ancient history. Simply amazing how good science and technology can be used to learn about the ancient world. Now, over three thousand years after his death, we can get closer to learning his likely cause of death and how he lived. In addition the use of DNA testing has let scientists and historians identify whose you're mummy including identifying The Mummy Formerly Known As KV55 as the Pharaoh Akenhaten. In the new study, the mummies of King Tut and ten other royals that researchers have long suspected were his close relatives were examined. Of these ten, the identities of only three had been known for certain. Using DNA samples taken from the mummies' bones, the scientists were able to create a five-generation family tree for the boy pharaoh. The team looked for shared genetic sequences in the Y chromosome—a bundle of DNA passed only from father to son—to identify King Tut's male ancestors. The researchers then determined parentage for the mummies by looking for signs that a mummy's genes are a blend of a specific couple's DNA. In this way, the team was able to determine that a mummy known until now as KV55 is the "heretic king" Akenhaten—and that he was King Tut's father. Akenhaten was best known for abolishing ancient Egypt's pantheon in favor of worshipping only one god. Furthermore, the mummy known as KV35 was King Tut's grandfather, the pharaoh Amenhotep III, whose reign was marked by unprecedented prosperity. Also, a mummy previously known as the Elder Lady is Queen Tiye, King Tut's grandmother and wife of Amenhotep III. King Tut's mother is a mummy researchers had been calling the Younger Lady. While the body of King Tut's mother has finally been revealed, her identity remains a mystery. DNA studies show that she was the daughter of Amenhotep III and Tiye and thus was the full sister of her husband, Akhenaten. Some Egyptologists have speculated that King Tut's mother was Akenhaten's chief wife, Queen Nefertiti—made famous by an iconic bust. But the new findings seem to challenge this idea, because historical records do not indicate that Nefertiti and Akenhaten were related. These news reports show a combination of history and science coming together to help unravel the mysteries of the ancient world, and how much more there is to learn, and of how much we thought we know isn't so. From the State to the People of course. The Detroit Free Press: Can-Michigan Free Up Cash By Freeing Up Prisoners? Is this a bad time to bring back good time? Gov. Jennifer Granholm and her administration's Department of Corrections have made the reinstatement of time off for good behavior for Michigan prisoners a key reform measure in the state's budget plan for 2010-11. Under Granholm's proposal, the sentences of about 5,600 prisoners would be recalculated, making them eligible for release within six months. Another 1,900 could be placed in halfway houses, with a combined savings to the prison system of about $130 million in the upcoming fiscal year. But enacting legislation to bring back good time -- which Michigan phased out from 1978-1998 -- will be daunting. The $130 Million in savings to the state of course does not include any setoffs for the costs to be incurred by the citizenry by allowing dangerous prisoners early release so they can get out and commit more crimes. Without a doubt the policy will lead to more crime and more costs on the victims of crime, which is why it was ended by a ballot proposal. Granholm said her goal is to bring Michigan's overall incarceration rate, still above the national average, in line with that of other states, especially in the upper Midwest. Reinstating good time, and a companion plan to move nearly 2,000 other inmates into halfway houses or tether programs as they near their release dates, would save $130 million in 2011, Granholm said. The problem is while she may bring the incarceration rate in line with other states that will not reduce the state's crime rate to becoming in line with other states and will likely lead it to increase. Indeed, Michigan has the highest violent crime rate in the midwest. Reducing criminals in prison to the same level as the Midwest overall without reducing the crime rate by the same proportion will by simple logic lead to an increase in crimes. Especially that even now, 48% of those in Michigan's prison system are back in prison within 2 years either for violations of parole or for new offences. While on paper having the state save $130 Million to drop its prison population to match other states in the Midwest sounds laudable, this completely ignores the costs, which will exceed $130 million to be imposed on the residents of the state at the hands of the early released criminals. There's a reason crime dropped as prison populations climbed - less criminals had access to their victims as they were locked up. Granholm wants to end this trend to make the budget look good, to keep liberals happy with their beleif in the failed "root causes of crime" ideology and to increase the felon vote for the Democrats (In Michigan felons can vote, just not while they're incarcerated). As usual Granholm's budget cuts are designed to hurt the citizens the most to make them more amenable to tax increases - public safety cuts, education cuts, corrections cuts - all key functions of government responsibility, not the softer areas that could be cut without much impact on the citizenry. So this morning in rush hour a few flakes of snow were falling. Nothing heavy but it was starting to leave its mark on the roads, but there was no perceptible slippage, at least not yet, we're due for a few inches of road wreckage today. Traffic was moving nicely. Note the "was". Until, on geting on a long one lane road a Ford Explorer turns onto it in front of the van that was ahead of me, and traffic starts slowing for no perceptible reason. Traffic starts backing up behind me. In looking there is no traffic ahead of the Explorer, all the cars in fromnt of it are well and truly out of sight, yet it is running 15 mph in a 45 mph zone. The van finally gets annoyed and passes it in a passing zone, I then have to wait and then pass when its clear in the next passing zone myself as yep, not the van's fault its the explorer driving very slow with not a car in front of it in sight. Why? There's a woman driving it and the rear left tire is flatter than a pancake. She's merrily driving along at 15 mph, blocking traffic and likely messing up her wheel. She's been obliviously driving for well over a mile with her tire in that condition and sees no point in stopping. There's plenty of side streets for her to pull into and wait for triple A if she can't change her own tire but that would require some thought. Luckily, I got around before the traffic entered a heavy traffic zone again, and looking back there's a whole line of cars crawling along behind her probably wondering what's the hold up. Amazing how one oblivious and inconsiderate person can wreck the flow of traffic for everyone, not to mention she's doing herself no favors riding on her rim. VP Biden Getting Second String Drivers Or Just A Ploy To Nationalize The Auto Insurance Industry? This is the third car accident involving Biden's motorcade or security detail in less than a week. On November 11th, a pedestrian was struck and killed by two Secret Service employees in Temple Hills, MD. In another incident yesterday, a sheriff's deputy was hit by a car while escorting Biden's motorcade in New Mexico. Transporting Biden seems to be a risk factor far greater than using a cell phone while driving, and likely could count as operating while impaired. After essentially nationalizing the US car industry, if Joe Biden's drivers keep this up, Obama's going to have to nationalize the US Auto Insurance industry to cover the losses. More and more, it appears that this administration likes to dither or avoid the real hard and unpopular decisions. Here it seems they're going out of their way to avoid having to decide whether to treat captured terrorists as captives of war, prisoners of war, or fodder for a civil criminal justice system. By killing them and rendering the hard decision of what to do with captured terrorists moot. WASHINGTON POST: Under Obama, more targeted killings than captures in counterterrorism efforts. The Nabhan decision [The assassination of a Yemeni Al-Qaeda operative in Yemen by US forces] was one of a number of similar choices the administration has faced over the past year as President Obama has escalated U.S. attacks on the leadership of al-Qaeda and its allies around the globe. The result has been dozens of targeted killings and no reports of high-value detentions. Although senior administration officials say that no policy determination has been made to emphasize kills over captures, several factors appear to have tipped the balance in that direction. The Obama administration has authorized such attacks more frequently than the George W. Bush administration did in its final years, including in countries where U.S. ground operations are officially unwelcome or especially dangerous. Improvements in electronic surveillance and precision targeting have made killing from a distance much more of a sure thing. At the same time, options for where to keep U.S. captives have dwindled. . . . "Over a year after taking office, the administration has still failed to answer the hard questions about what to do if we have the opportunity to capture and detain a terrorist overseas, which has made our terror-fighters reluctant to capture and left our allies confused ," Sen. Christopher S. Bond (Mo. )....Some military and intelligence officials, citing what they see as a new bias toward kills, questioned whether valuable intelligence is being lost in the process. "We wanted to take a prisoner," a senior military officer said of the Nabhan operation. "It was not a decision that we made." To use The Instapundit's turn of phrase: They told me if I voted for McCain that terrorists would be killed extra-judicially without benefit of all the trappings of a full court of law and legal process -- and they were right! Obama Backing Away From Domestic Civilian Trials of the 9/11 Terrorists? White House officials sought on Friday to stem mounting criticism of President Barack Obama's handling of terrorism cases, saying they would not rule out using a military court to try accused Sept. 11 mastermind Khalid Sheikh Mohammed. Both Attorney General Eric Holder and White House spokesman Robert Gibbs did not rule out a military trial when asked about the Obama administration's options. Trying Mohammed in military court would mark a further political retreat from Holder's announcement last year that the five Sept. 11 suspects now held at the U.S. military prison at Guantanamo Bay, Cuba, would be tried in federal court in New York. Could it be he's finally run out of people to try and impress. Certainly as Michael Barone insightfully points out, Obama's lily-livered conduct of the war on Islamic extremism isn't impressing anyone. The decision could complicate efforts to intensify screening of potential terrorists who are Muslim. After the Christmas Day bombing attempt in Detroit by a Muslim suspect from Nigeria, some have called for the use of body scanners at airports to find explosives and other dangerous materials carried by terrorists. Some airports are now in the process of buying and using the body scanners, which show in graphic detail the outlines of a person’s body. After all, this same group is against having police dogs present in searches of Muslims as that's un-Islamic too. An earlier version of the group started in the 1960s with the Muslim Students Association of the United States and Canada. The chairman of the Fiqh Council is Muzammil Siddiqi, religious director of the Islamic Society of Orange County in California and former president of ISNA. You will of course note that "Muslim Students Association of the United States and Canada" is the North American branch of The Muslim Brotherhood, known in various spots as The Muslim Bortherhood, or HAMAS, with an even more violent off-shoot named Al-Qaeda. So we have supporters of terrorists and their aims claiming that anti-terrorist measures are un-Islamic - how very convenient. It's too bad there's not a fatwa from them on committing acts of terrorism against civilians - without any qualifiers. Even on the outs, in her last year of her last term as Governor and as Michigan continues to be blown away, with the highest unemployment and foreclosure rates in the nation, Governor Granholm is still proposing raising taxes. Gov. Jennifer Granholm's proposed new budget calls for lowering the state sales tax from 6% to 5.5%, and expanding it to services. The additional revenue -- about $550 million in 2011 -- would all go to public schools. She's truly a one-trick governor, with the only trick repeatedly trying to raise taxes. Oh, and cut vital services and education instead of less vital governmental programs. Also, physicians would be taxed on gross receipts to generate $133 million, which would be used to leverage more federal money to pay for treatment of Medicaid patients. The governor also called for a new tax on rental cars to fund the Pure Michigan national advertising campaign to draw more tourism to the state. In return for the taxes she'd reduce some business taxes and stick it to non-union state employees. Nice. hree security guards watched a group of teens punch, kick and rob a 15-year-old girl in the downtown Seattle Metro bus tunnel without intervening. Security video shows the guards call for help on their radios, but they don't go to the aid of the girl even as she is being kicked in the head. A dispute involving a group of 10 teens apparently started inside a department store the evening of Jan. 28 and moved to the bus tunnel at Westlake Station, where the girl was attacked....Metro Transit General Manager says it's revising its policy that guards only "observe and report" problems. That would certainly help, now wouldn't it? Of course, the quality of 3 security guards that stand idly by and watch a teenage girl get kicked in the head and do nothing, policy of non-intervention or not, is hardly confidence inspiring. The Iranian nuclear situation appears to be desperate but not serious, at least not to the Obama administration. Foxnews: U.S. Slaps New Sanctions on Iran Revolutionary Guard Not very broad-based or truly pressure inducing. Hardly a reasonable response to Iran's constant gamesmanship and breaking of every agreement while it pushes to develop nuclear weapons. It seems that Obama's mantra is to aways talk softly and carry a tiny stick, and never, ever use the stick. President Obama said he's "bent over backwards" to engage Iran in "constructive" dialogue and the U.S. will push the United Nations to sanction the country. Iran told nuclear inspectors on Wednesday that it will begin higher-grade uranium enrichment within days, Reuters reported. "That indicates to us that despite their posturing that their nuclear power is only for, for civilian use that they in fact continue to pursue a course that would lead to weaponization," Obama said during a press conference Tuesday. "That is not acceptable to the international community. Defense Secretary Robert Gates said the Obama White House has gone further than any administration to reach out to Iran, and called the move "disappointing." He said Tehran is violating a Nuclear Non-Proliferation Treaty and is refusing to sign off on an IAEA-brokered deal that would allow Tehran to be supplied with nuclear fuel for its medical reactor in exchange for its low-enriched uranium (LEU). "I have never seen an administration reach out in as principled and comprehensive a way as President Obama has done," Gates said in a press conference Tuesday in Ankara, Turkey. "The response has been quite disappointing." Wow, that could not have been predicted now could it? Now how has that back-bending and extending a hand been working out lately? Disappointing isn't it when all the high-faluting platitudes about restoring of America's standing in the world and efforts with "principled and comprehensive" talks instead "cowboy diplomacy" falls flat on their face and garner no results? Newly released aerial photos of the Sept. 11, 2001, World Trade Center attack show the towers coming down from a dramatic new angle. The photos were obtained by ABC News, which filed a Freedom of Information Act request with the National Institute of Standards and Technology last year. The NIST collected the images as part of its investigation into the terrorist attack. ABC said it was provided 2,779 pictures on nine CDs. Many of the photos, taken from police helicopters, have never been released before. Twelve of the photos appear on ABC’s Web site. One photo shows a close-up of the upper floors of the burning towers. Others show the towers’ dramatic collapse in a thick plume of smoke and debris and sweeping views of billowing smoke clouds. Is it just a coincidence that ABC News waited until after the election and Bush had left the presidential office to file a FOIA request for these pictures? Wouldn't want release these during the election and remind anyone of the attack, the consequences of downgrading a focus on or external enemies, right?. It wouldn't do to get Americans riled up about terrorism when their favored contender wants to be focusing on a domestic agenda and the triumph of diplomacy and talking over action now would they? Go look at the 12 pictures that ABC posted of the 2,779 they were provided. I wonder what's in the pictures they did not release? Quite a nice snowstorm hit us here in south east Michigan, building up gradually from a slow and steady sprinkle starting yesterday around 9 am picking up heavily by 9 pm and continuing all night. So much so that after shoveling the driveway clear at 7pm so Natasha could make it back, I couldn't see the driveway anymore at midnight and it was as if I never shoveled. Not as bad as what hit the mid-Atlantic states but then again our legislators are proportionally less damaging than the national ones so fair is fair. The way home after work was reasonably clear, only messed up by a twit in a Benz that on the one lane road homeward had to go 5 mph and stack up the entire street behind him. It was impressive to watch - from a clear, smoothly moving street to a dead crawl with traffic well and truly backed up thanks to one moron, nicely done. So we're kinda snowed in here today. Luckily enough or through decent foresight we have all the necessities for making French Toast, which is apparently traditional for a snow day. So French Toast we shall have. We also have abundant supplies of coffee and all the ingredients for real hot chocolate so life is good. Schools are closed, I brought my work home yesterday so I shall enjoy tele-internet-lawyering and do all my work without seeing the inside of my office for a day. No one is getting off our street, though it is entertaining to watch them spin out trying. With this snow encrusted hill, no one is going anywhere for the remains of the day or until a plow comes through, whichever doesn't arrive first. Sweden's unemployment agency has been found guilty of discrimination for expelling a Muslim man from a job training program because he refused to shake hands with a woman. A Stockholm court Monday ordered the Public Employment Service to pay 50,000 kronor ($6,700) in damages to an immigrant from Bosnia who lost his jobless benefits when he was kicked out of the program. Citing his faith, the man had refused to shake hands with a woman when he was interviewing for an internship. The agency said his behavior was part of the reason he didn't get the position, and decided to exclude him from the program. The court ruled that the man was discriminated against because of his religion. It wasn't immediately clear whether the ruling would be appealed. Now does the woman get a chance to sue him for discrimination for refusing to shalke hands with her, or would the multi-cultis' heads explode over that one? And in other Islamic discrimination news a British teacher is fired for being intolerant because he complained his students were cheering for Jihad and stating that Jews and Christians like himself are Muslim's enemies. A British teacher was fired from his job after complaining that some of his Muslim students were celebrating the Sept. 11 hijackers as "heroes," the Daily Mail reported. Nicholas Kafouris, 40, who taught at East London's Bigland Green Primary School for 12 years, is suing the school for racial discrimination after he was allegedly forced from his post because he would not tolerate the remarks of his students. Kafouris claims members of his class, some as young as eight years old, openly praised Islamic extremists in his classroom, hailing the terrorists behind the attacks of Sept. 11 as "martyrs," the Daily Mail reported. Kafouris alleges the students told him they "want to be Islamic bombers when we grow up," and "the Christians and Jews are our enemies, you too because you're a Christian," according to the Daily Mail. You can't make this stuff up, as situations like this are quite unbelievable. But in this benighted age it is not fiction but fact. Iran's president Mahmoud Ahmadinejad ordered his country's atomic agency on Sunday to begin the production of higher enriched uranium, in a move that's likely to deepen international skepticism about the country's real intentions on the crucial issue of enriched uranium. In comments broadcast on state television, Ahmadinejad said: "God willing, 20 percent enrichment will start" to meet Iran's needs. U.S. Defense Secretary Robert Gates is calling on the international community to rally together to pressure Iran into abandoning its nuclear program. Gates, who's in Rome as part of a weeklong European trip, told reporters Sunday that if the international community stands together to bring pressure on Iran he believes there's still time for sanctions to work. Sure, nothing to see here, just keep talking without doing anything as Iran continues on the road to a nuclear capability. Don't you wish Obama would finally find the wherewithal to say "the time for bickering is over" to someone other than Republicans? Preferably to an actual avowed enemy of the United States poised to obtain Nuclear Weapons? Reverse: Genius standing left with legionary standard to right. Inscription: GENIVS EXERC ILLYRICIANI - Genius (spirit) of the Armies of Illyrica. C. Messius Quintus Traianus Decius (say that five times fast), known to history as Trajan Decius, was the governor of Lower Moesia. Upper and Lower Moesia are just about where modern-day Serbia and Bulgaria are located. He was sent by Philip I to put down the revolt of Pacatian in Upper Moesia and after the rebels killed Pacatian, he was induced by the same rebels to be the new contender and quickly marched on Rome. After defeating and killing Phillip I in battle (Philip had himself killed Gordian III to become emperor), Trajan Decius became emperor in 249 AD. His reign lasted 3 short years, coming to a rather dead end in late 251 AD when he was killed in a battle with the Goths at Abrittua. Like Philip I, the loyalty of the armies was paramount. After all, Trajan Decius came to power by using the legions to dethrone Philip I, and his rule could be subject to a similar challenge by restive army commanders and armies. This coin promoting the spirit of the legions in Illyrica (essentially modern day Albania) was important to ensure the loyalty of the legions receiving these coins there and reminding them who was paying them. The Hamas government in Gaza on Saturday backtracked on its apology earlier this week in which it expressed regret for harming Israeli civilians in rocket attacks. The apology had signaled a rare deviation from Hamas' violent ideology, and the subsequent zigzag reflects the Islamic militants' conflicting objectives. Not so much, it got positive press for the apology and then retracted it because it didn't mean it and wanted to signal to its members and supporters that it was going to continue to attack civilians. Quite a ham-fisted and unbelievable apology in the first place. The backtracking is similarly unbelievable. Standard procedure of saying on thing for western ears to hear (or at least hear initially) and then another for themselves. Nice game if you can play it and never get called on it. As reported by The Detroit Free Press and comented on by the blogprof: John Conyers (D) Wants Haiti Relief Official Demoted Because They Have Too Many White People On Staff. Yes, really. You can't make this up. Notice how he doesn't say Haitian Americans, just not enough African Americans. Perhaps it's because he's concerned that there are insufficient African Americans on staff who could identify with Haiti's run-of-the-mill, everyday corruption. After all we could have for example sent his wife Monica Conyers found guilty of bribery, her aide Sam Riddle, being tried for bribery, Kwame Kilpatrick - some perjury and corruption costing the City of Detroit millions. Perhaps Charle Pugh should also be sent to help enhance nepotism, or Jewel Ware, resigning from Wayne County Council after hiring felons and phantom staffers paid for not working. Yeesh, lets just send them all the Detroit politicos to Haiti to show them how corruption is really done. Shark attacks are quite rare, and combined with their swiftness and sudden attacks without discernable warning tends to shock people's senses, which is why when someone gets killed by a shark its considered newsworthy. There was blood in the water, the sharks were circling and a grievously hurt Stephen Schafer -- his thigh gashed and his hand mauled -- was screaming in pain by the time the lifeguard reached him. The lifeguard pulled Schafer onto his rescue board, but his cries quieted as he drifted in and out of consciousness. He would soon be dead, marking the first deadly shark attack in Florida in five years, and perhaps a rare instance of a lethal attack by a swarm of sharks. Schafer, 38, was attacked Wednesday afternoon a quarter-mile off South Florida's Atlantic Coast while he was out kiteboarding -- using a large kite-like sail to pull him along the surface on a board strapped to his feet. When the winds lightened and his sail dropped, the Stuart man found himself in the water, surrounded by sharks. One problem is that on a board and in a dark wetsuit at the surface of the water, some surmise that you as a swimmer look like a seal to a shark and worthy of a test bite. In any case, note how rare it is - the first lethal attack in Florida in five years, of course that's no consolation to poor Mr. Schafer. Sadly, he fell victim to some very bad luck indeed. As dangerous as sharks may be, you're in far more danger travelling to or from your dive/swim/surfing/kiteboarding site due to the risk of a vehicular accident than you are in the water itself. Will Granholm seize renewable power? Answer - No, thankfully she's term limited, so no renewable power for her. Late doesn't adequately describe the significant state budget reforms she outlined during her eighth and final State of the State address last night in Lansing; they're more accurately pegged as eleventh-hour. No kidding, finally accepting the need for reform in the last year of her second term-limited term. To be charitable, one could suppose that Granholm simply didn't have the capability to buck the leftist ideologue Democrat and Unionist stranglehold on the Michigan Democratic party and maybe now she feels she has nothing to lose so can move ahead and get things done. She's pretty smart so perhaps that's why shes moving now. or is it simply a last minute shot at trying to save her reputation from oblivion as an ineffective governor watching as this once-great state collapses? The blogprof noted the GOP was quick to sum up Granholm's failings to address real reform and deal with Michigan's problems throughout her governorship and now her sudden quest to come up with reforms. To put it simply: As long as the GOP doesn't totally screw it up, 2010 is going to be a Republican year both in Michigan and across the USA as people have certainly had enough of the Democrats anti-free-market politics of misery. With great fanfare, the $22.5-million Rosa Parks Transit Center opened in July, promising Detroit bus riders a 24-hour shelter that included rest rooms, a bus fare cashier station, information and security booths, a coffee shop and other retail outlets. Yet, on any given day or night, riders from around the region are met with "Temporarily Closed" signs posted on the center's doors. That's because they don't have enough money for security to keep it safe. Really. In a memo obtained by the Free Press, Detroit Department of Transportation officials admit that the transit center closes at various times during the week and weekends because of the city's current fiscal constraints -- its inability to maintain appropriate staffing levels because of the layoffs of security personnel. A transit center closed at odd times due to lack of funds for security, leaving people stuck outside of it waiting for the base in likely even more unsafe conditions. Though there's a need for more security -- not less -- at the transit center at the corner of Michigan and Cass, six of the 16 security guards hired to protect Detroit Department of Transportation properties have been laid off in recent months. When it becomes evident to DDOT officials that they do not have enough personnel to keep the center open, they close it. The practice has been happening since November, just as temperatures started to drop. "It seems like it closes when it's at zero or below zero," said Clifford Grose, 59, who rides the bus daily. The Detroit Police Department has increased patrols of the transit center, which also serves as a hub for SMART, Transit Windsor, Megabus and the People Mover. Still, city officials say drug trafficking, loitering and even assaults are a daily occurrence. Now that sounds like an attractive alternative to the personal motor vehicle or carpooling with trusted friends now doesn't it? After urging Democrats to double down and pass the Obama agenda even while the Dems are looking at a tidal wave of electoral disatisfaction, obama couldn't help take a poke at the Republicans for not rolling over and doing everything he wants. Obama again chided Republican senators for routinely using the filibuster tactic. He said Democrats in 2009 had to cast more votes to overcome that procedural delay than were needed in the 1950s and 1960s combined. "That's 20 years of obstruction packed into just one," he said. Can anyone guess how many such maneuvers were used by the Democrats when Bush was president? My bet is that obama cherry picked the 50s and 60s to cover the obvoious - the Deomocrats have been playing the obsrtructionist as well and turnabout is fair play, not to mention a common-sense attempt to stop the Obama juggernaught form reshaping the economy into a new progressive paradise (i.e. a total mess). Obama used the same language toward Republicans as he did toward extremists in the Muslim world in his inaugural address. Of Republicans on Wednesday, he said, "We extend a hand and get a fist in return." In his inaugural address, he said the United States "will extend a hand if you are willing to unclench your fist." Obama was countering the Republican argument that he doesn't accept any of their ideas. The problem is that extended hand to the Republicans had a middle finger outstretched with the remaining fingers curled back and was accompannied by the words "I Won" and the "time for bickering is over". Just after I finished the previous post, the jury came back with a verdict on the Al Siddiqui trial: She was found GUILTY of Attempted Murder of a US Serviceman today. An MIT-trained Pakistani woman was convicted this afternoon of trying to kill Americans while detained in Afghanistan in 2008. The tirade-prone Aafia Siddiqui, 37, was found guilty by a jury in Manhattan federal court even after she denied charges that she had opened fire on US soldiers and FBI agents in Afghanistan. After the verdict was read, Siddiqui turned to the gallery, pointed her finger in the air and said: "This is a verdict coming from Israel, not America, and that is where the anger belongs. I can testify to this and I have proof." Siddiqui, 37, was convicted of two counts of attempted murder, though the crime was not found by the jury to be premeditated. At leat the jury was not intimidated and came to the appropriate conclusion. Now does the time and expense of the trial, defendant's theatrics and mockery of the court demonstrate the silliness of charging terorists with criminal acts in a US District Court, especially for acts they committed overseas, to now have them sentenced and imprisoned in the US to serve their sentences? Does it really make sense to charge foreign terorists under the US criminal code for acts committed overseas? My bet is the Obama administration continues this wrongheaded pattern of treating terrorist acts as US criminal law questions. Jurors heard a U.S.-trained Pakistani scientist portrayed Monday in closing arguments at her attempted murder trial as both a would-be terrorist determined to kill Americans and a fearful woman framed by the government. Assistant U.S. Attorney Christopher La Vigne cited testimony that Aafia Siddiqui had bomb-making instructions, documents referencing a "mass casualty attack" and a list of New York City landmarks including the Statue of Liberty when she was detained in Afghanistan in 2008. Siddqui was carrying "a road map for destruction — documents about attacking the United States," he said in federal court in Manhattan. During the two-week trial, FBI agents and U.S. soldiers testified that when they went to interrogate Siddiqui at an Afghan police station, she snatched up an unattended assault rifle and shot at them while yelling, "Death to Americans." She was wounded by return fire but recovered and was brought to the United States to face charges. The Pakistani government is paying for part of her defense. She has used the civilian court system to shout anti-American propaganda and spew hatred against Jews, cause legal chaos, and make a mockery of the rights she has been granted. al Qaeda has been trained to game the system. The Western-educated Siddiqui is milking it for all it’s worth. On Monday, she was thrown out twice for outburts. Her defense team is now asking for, you guessed it, a mistrial....Two jurors were also let go after a man sitting in the courtroom pointed at them, used his finger as a gun to pretend to shoot them, and mouthed an obscenity. Read all of Michelle's Malkin's account of the trial antics and given her behavior it is pretty clear she's not some poor little innocent but rather an Al Qaeda player. The trial shows once again the wrongness of the Obama Law-Enforcement view of this war. Indeed, Al Sidiqui does not appear to have been charged (see the complaint against her here) with using a machine gun to commit a crime of violence as the Blackwater Guards were charged? Why not? It certainly seems like a missed opportunity and to overcharge stretch a statute as far as possible and at least in the direction of someone who deserves it an is rather inconsistent with the riddiculous stretching of the statute towards the Blackwater employees. Terorrists get undercharged, Americans get the book creatively thrown at them, doesn't seem fair somehow. Just wait for the 9/11 conspirator trial to see this bit of Obama misjudgment and Al Qaeda lawfare in full bloom (or is that full boom?). After all $200 million plus per year in security costs and massive disruption to New York City just to play image politics suddenly sounds like a bad idea when New Yorkers, particularly some pretty key and influential Democrats among them, realized what such a trial and its attendant risks would mean. May I suggest a convenient and very secure military base that has a great deal of expertise in holding such terrorists? It should be noted that this peaceful Imam opened fire on the FBI as they came in with a warrant, killing a police dog. Typically when you start shooting at FBI agents you're inviting return fire and you're not going to win. Indeed with 4 agents, 5 shots each, all hits, I'd call that good shooting indeed. The chairman of the House of Representatives Judiciary Committee, U.S. Rep. John Conyers and the Michigan chapter of the Council on American-Islamic Relations want a separate investigation. Outside the Dearborn Police Department, a small group of protesters stood near a sign that said, "Stop FBI Terror!" Hey, try to shoot FBI agents and you're playing by big boy's rules - expect to get hurt. A lawyer for Abdullah's family, Nabih Ayad, questioned the FBI's tactics. "A lot of raids are conducted when a suspect has a gun. That doesn't mean you shoot them 20 times," Ayad said in an interview. Wrong, yes it does mean exactly that. The FBI like most law enforcement, and indeed private civilians are trained to shoot to stop the threat - as long as the attacker is still pointing a gun, had indeed fired the gun, and was clearly a threat, you keep shooting until the threat ends, whether by the attacker ceasing the attack, dropping the weapon or dropping himself. Given the entire episode took 4 seconds, I'd say they acted quite appropriately. On the upside for Luqman Ameen Abdullah, I hear the Detroit Red Wings are looking to talk to him. After all, they figure that anyone who can stop 20 shots with their body in 4 seconds has got to be a good contender to be a goalie for the Red Wings.